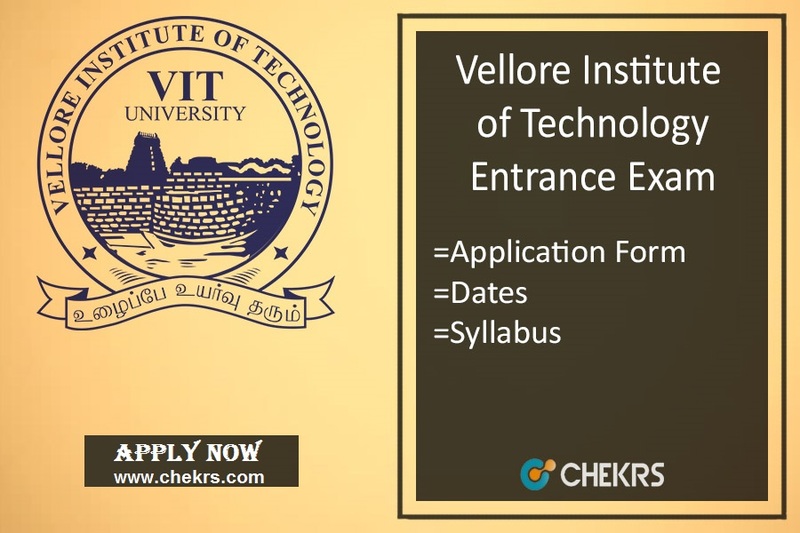 VITEEE 2018: Vellore Institute of Technology, Vellore will conduct the VIT Engineering Entrance Exam 2018 in April in both online and offline modes. The aspirants have to submit the VITEEE Application Form 2018 before February month on the official website. The forms will be released in November. The aspirants have to submit the form to take part in the entrance exam for Vellore University Admission 2018. The authorities conduct this exam to provide admission in the various engineering course of the University. The students have to submit the VITEEE Registration 2018 on the official website. The application form will release the application form in November. The deadline for the submission of the online and offline form is in February 2018. We have provided here the direct link for the submission of the VITEEE Registration Form. They just have to follow some precise procedure for the submission of the form. Steps to submit VITEEE Application Form. They can also click on the link given below. Now enter all personal and valid details in the form like name, educational qualification etc. Now attach the scanned copy of the documents, photograph and signature along with the form in the prescribed size. Now pay the desired application fee. The students have to collect the form from the application form centres. They can also collect it from the University Campus. Now they have to fill the form with personal details carefully and correctly. The next step is to attach a passport size photograph on the application form. The aspirants have to send the form to the address mentioned here in the article. The students can pay the application fee through any of the online modes. They have to pay Rs.1200 for the application form. In offline form case, they have to submit a demand draft of Rs.1200 at the application form centre or via post. The Students must have born after July 1st, 1995 as per the University norms. The student must have completed 12th class from any recognized board. They must have physics, chemistry and mathematics as their compulsory subjects. The aspirants must have scored minimum 55% marks in heir intermediate and 60% marks in each subject. The students who are appearing in the intermediate can also apply. The student must have scored 80% marks in PCM. Negative Marking: Zero marks will be deducted for each wrong answer. The aspirants who are preparing for the entrance exam. They have to check the Vellore University Entrance Exam Syllabus. The exam will be the combination of Physics, Chemistry and Mathematics sections. The questions in the exam will be asked only from this syllabus. The pdf for the exam syllabus is provided here for the ease of the students. They just have to study the VITEEE Syllabus Pdf on regular basis. The aspirants who will follow the proper preparation procedure will have more chances to qualify the exam easily.